Backnang, a city with approximately 35.000 inhabitants, lies northeast of Stuttgart. The Germans of Hungary consider it one of their cultural centres in Germany. The first documentary evidence of Backnang can be found in 1067 and the settlement had turned into a proper city as early as the 13th century. World War II changed Backnang significantly; it was massively destroyed in several air raids and the population diversified due to the influx of refugees and displaced people. The quiet Pietist small town turned into a prospering industrial city that attracted many workers. Among Backnang’s new citizens were many displaced Germans of Hungary, most of the 6.000 people had been forced to leave the southern Hungarian Bácsalmás in 1946. From 1957 onwards, the Bácsalmás people organised a commemorative meeting in Backnang and kept close ties to their home town. In 1959, Backnang city council passed a resolution to sponsor Bácsalmás and this turned into a proper city partnership in 1988 – one of the first city partnerships between Germany and Hungary. Since 1971, the city opts as patron for the Germans of Hungary as a whole group. They are represented by USK, the social and cultural association of the Germans of Hungary and since 1971 hold a biannual conference in Backnang. Furthermore, the city of Backnang and the USK award a cultural prize every two years and hold a yearly “Ball of Swabians”. 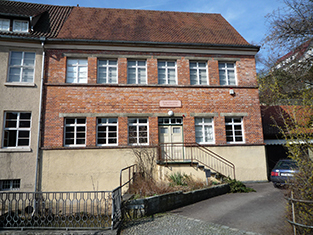 In 1977, USK created a heritage museum of Germans of Hungary in Backnang. The collection grew steadily and many Germans of Hungary sponsored the museum or worked as volunteers. In 1984, the museum moved into a historical mill where it can still be found today. 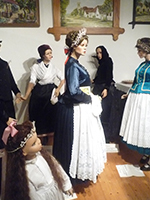 It is the largest museum for Germans of Hungary and presents their history in Hungary, especially in “Swabian Turkey” and Bačka. Also, the partnership between Backnang and Bácsalmás features in the exhibition. The museum of Germans of Hungary is located in a historical mill. LEFT: Parting of a bride and her parents in original costume from Budajenő abd Telki. 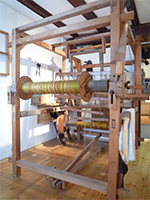 RIGHT: Weaving loom built by German of Hungary weaver Josef Schloder in Backnang.